11% ABV, 30 IBU, OG=1.110 per the website. 2016 vintage. Brewed with traditional English hops. Thick layer of yeast at the bottom. Pours out to a lightly cloudy chestnut with lots of flittering bits of stuff (hops and yeast) bubbling around despite standing upright in my fridge for well over a year, forming a moderate yellowish/light tan head with good retention and lacing. Carbonation is quite mild, probably slightly less than 2.0 carbs. The nose is of strawberry jam, black cherry juice, molasses and faint soy sauce. Mouthfeel is smooth, lightly cloying, dense bodied. The taste is a recap of the aroma...lots of strawberry jam and molasses. Bitterness is quite mild and earthy. Light oxidation, warming alcohol, subtle fusel alcohol in the finish and aftertaste, bitterness gain strength in the aftertaste which improves the drinkability. Mildly metallic and leather in the aftertaste as well. A decent strong old ale, however slightly less enjoyable due to the gunky pour, oxidation, the metallic note, and fusel alcohols which mar an otherwise nice brew. I would drink Founders Curmudgeon, Bells Third Coast and Averys Old Jubilation over this however. Poured into a Chimay goblet vintage 2016?at near room temperature. Go a half inch tan head that after sipping leaves plenty of thin wisps of lace behind. Smell is dates, oaky vanilla, caramel, toffee, gram cracker, and some hints of alcohol. Taste follows dates, oaked vanilla, toffee, and warming alcohol. Mouthfeel is almost large, moderate life, a tad dry as you would expect, and a slow sipper that goes down way faster than you want because of its complexity. Overall this is a beer snobs jam, a beer made for people that want something tasty and unique. Well done. are there without being overtly obscene making for a fantastically balanced ale that is rich and full. 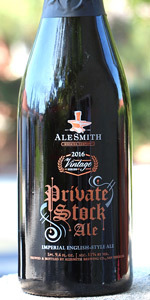 Overall, one of the best I have had from AleSmith who always delivers rich full bodied ales. A - Pours a hazy raisin chestnut color with thin , off-white lacing, no carbonation. Lots of legs on the sides of the glass. S - Raisins, brown sugar, figs, plums, dark fruit, alcohol. T - Roasted toffee, alcohol, brown sugar, figs, roasted caramel, lingering pine bitterness, some lingering pine bitterness. O - Pretty solid Old Ale. Poured into a tulip a very nice translucent dark brown color, very nice carbonation, with a very nice thick/creamy one-finger light tan head, which leaves some sticky lacing behind. The nose is malty, kinda yeasty, with some nice cherries, figs, plums, raisins, slight vanilla. The taste is pretty nice, malty, yeasty, with some dark fruits, vanilla. Full Body, ABV hidden fairly well. Overall, a pretty tasty brew.